Hospital bosses have reassured South Tynesiders that vital A&E services are set to stay after trusts agreed to form a partnership. Earlier this week, it was revealed that South Tyneside NHS Foundation Trust and City Hospitals Sunderland NHS Foundation Trust have made a commitment to work more closely together. Coun Lee Hughes, the Putting People First representative for the Bede ward, has urged the trust to confirm that South Tyneside Hospital’s A&E department won’t be moved. There are fears for the service after June 2012 saw the closure of the Harton Lane hospital’s children’s ward. 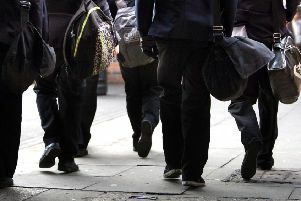 Now youngsters who need long-term treatment – more than 24 hours – have to travel to Sunderland Royal Hospital or Newcastle’s Great North Children’s Hospital for care. But Steve Williamson, chief executive of South Tyneside NHS Foundation Trust, says it is its ‘intention to maintain’ an A&E department on the South Shields site. Coun Hughes, who has six children and four grandchildren, said: “I want assurances that there’s no plans to move the A&E service we have at South Tyneside Hospital. “We were informed only the day before, via email, that the two trusts would now be working more closely together – it’s totally came out of the blue. “Services have already been moved from the hospital in recent years. For almost two years there were fears surrounding the children’s ward, with nobody confirming or denying its future, until it finally went. Both trusts, which will serve a total population of 430,000, say they see the importance of a hospital in each of their areas and providing a range of emergency and planned services, but say there is an “urgent need to rebalance services” as it is no longer safe or sustainable to duplicate some care at each location. The South of Tyne Healthcare Group will embark on an ambitious programme of reconfiguring services. In South Tyneside, where the trust has been moving away from complex acute services, will lead on out-of-hospital rehabilitation, diagnostic and screening services, as well as community services in partnership with both councils and primary care teams. Mr Williamson said: “We are still at a very early stage in developing the South of Tyne Healthcare Group’s approach and we will be undertaking significant work with our clinical teams in the coming months to identify the changes required to protect the future sustainability of healthcare for communities across South Tyneside and Sunderland. “We anticipate that each trust will provide a broad range of emergency and urgent care services and we will be working together on these and other important service areas to ensure our service model delivers the best possible outcomes and care for all of our patients.